The New Vic’s latest production is a gritty drama set in Liverpool in the slums of Liverpool in 1854 and featuring a family of five who are battling to survive in a world of poverty and beset by outbreaks of cholera which devastate families within days. It was the first play written by Lizzie Nunnery and was shortlisted for the Meyer-Whitworth award in 2007. It is directed by Zoe Waterman, the final play of three that she has directed as Associate Director at the New Vic. Millie Sildnes ( Krissi Bohn) is a woman with a history who has found happiness with Norwegian traveller Brynjar Sildnes (Oystein Kanestrom) . Brynjar is Millie’s second husband, since the first drowned at sea, and they have living with them her two almost grown children, Ruairi (Thomas Grant and Niamnh ( Niamh Finlay). Millie hopes that the ambitious Brynjar will take her away from the grinding poverty and her need to sell unpicked rope at the market in order to make ends meet. However although Brynjar is obviously upwardly mobile he is also a fantasist who writes home to his father telling of his imaginary life in America but not telling him that he is now married, living in Liverpool, and has two step-children with another child on the way. The audience is never sure if Brynjar’s plans for a better job and a decent house on Lime Street will come to fruition and Millie is not sure if she is suited to such a life, when she is used to settling arguments on the street with her fists. Also living with them is her father, Fergal, an ailing fantasist, who enthrals Ruairi and Niamh with his tales of a seafaring life…but are the stories all true? The whole cast perform very well on a small set built to reflect the tiny cellar room in which whole the family live. However the if there is a criticism of the play it is its static nature, especially in the first act in which essentially we are simply introduced to the five characters. 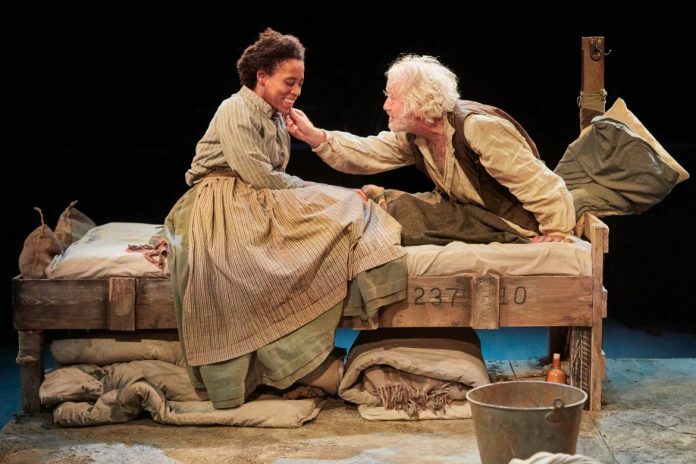 As a result the play is not always ideal for a theatre in the round, such as the New Vic , as the actors are often sitting or standing with their back to half of the audience whilst speaking their lines. The set is cleverly designed on what is almost a roundabout which the actors push around from scene to scene giving the audience a new perspective but this is not always successful as it means that some of the lines become inaudible to parts of the audience . It is not all gloom and doom for the audience however as music plays an important part in their lives and an upright piano which belonged to Millie’s first husband dominates their small room. There is the constant sound of music from the neighbouring rooms, much of it coming from their Irish heritage. This is a play that will in parts shock you at the poverty and violence but will also bring a smile to your face as the family battle against everything that is thrown at them. “ Intemperance” runs at the New Vic until Saturday April 20th. Next articleWork is taking place to produce a neighbourhood plan for a Moorlands town.